I have a form that five individuals need to approve - in a SEQUENTIAL fashion. We would like to setup the form to where is sends an email to first approver, they Approve/Decline in email message and that 'ACCEPT/DECLINE' is passed to form. Then form sends to the next approver. Is that possible? I've worked with the form to where it sends out the email to all and they can use the clickable link in email message but we don't want approvers to have to go to form and we want it to sequentially feed to next person. Please advise. Good day! I can came up with a workaround since I think it requires to do so. But this workaround will let the approver access the form to continue passing data to all other approvers. 1. 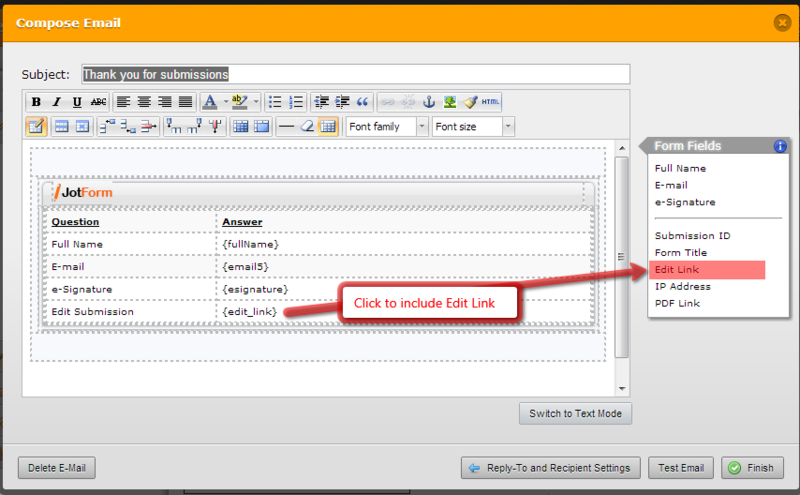 On your form - add text boxes or text area field to let the approvers note that the submission is approved or not approved. I guess you have this already to the form. Note that you will have to add the "EDIT" function to Form Notification so they will be able to do this. For every approver, you will receive notification once they submit the data again. I am hoping that this works for you, let me know if you need clarifications. We have been able to setup the 'conditional logic' but I am unclear of the Edit link functionality. Our form can be found at http://form.jotform.us/form/30804181049146 . Again I want to 'pass' from an email the APPROVED status to fill in the form - not have the submitter go to the form. Is that possible? Do I need to create a NEW THANK YOU EMAIL for each approver??? 1. The User submit data to the form. 2. The APPROVER 1 receives the email from the user, the APPROVER 1 then edit the submissions and put "Approved" to the Approver 1 box, then he/she click "Send"
3. 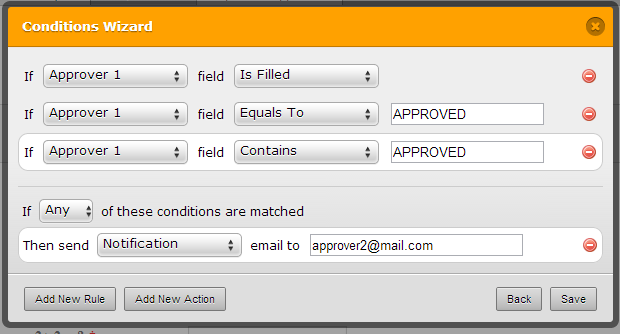 After Approver 1 click "Send" button, the Approver 2 Receives the Notification since we apply conditional logic. Approver 2 "edit" the submissions again and put "Approved" to the Approver 2 section. Click "Send" button again. 4. 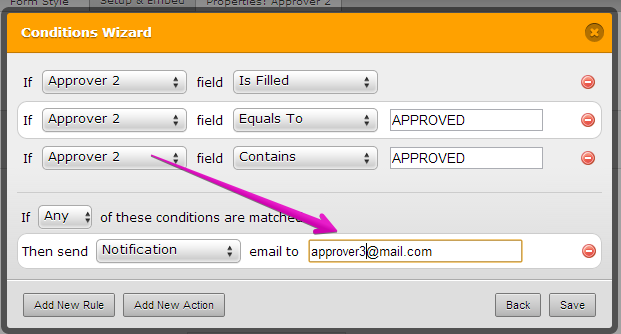 After Approver 2 click "Send" button, the Approver 3 Receives the Notification since we apply conditional logic. Approver 3 "edit" the submissions again and put "Approved" to the Approver 3 section. Click "Send" button again. For every Edits, you will received a notification via email with Prefix "EDIT". You do not need to create New Email Notification. You can create just one, but if you'd like to personalize every approver emails, you can create 2 or more. Some more idea here: http://www.jotform.com/answers/108795, you can also search the forum. 1. The form is filled out by a user, the user selects which initial person needs to approve - selects the SUBMIT button on the JOTFORM and an email is sent to the 1st APPROVER. 3. The link passes the APPROVE (variable) to the appropriate field and then kicks off additional CONDITIONAL LOGIC. This continues until all approvals are done (Total of 4). Question: 1. How do I pass a variable = APPROVE in the 'Email after Submission' without having approver select the SUBMIT button again on the FORM. Note: We don't want the approvers to go to the form = only pass data to the form. 2. How do I assign it to the appropriate FIELD in the Original Form? 4 separate approvers. Where do I place the APPROVE as a variable and is the sid the assignment to the correct FIELD in the link above???? 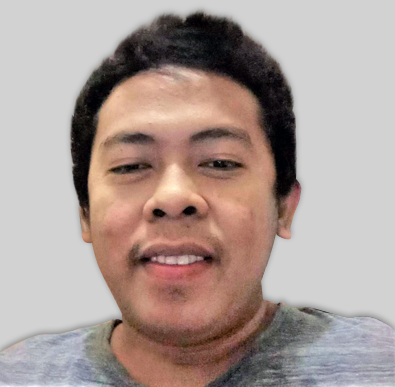 Let me answer your questions on behalf of my colleague. "No resubmit needed. 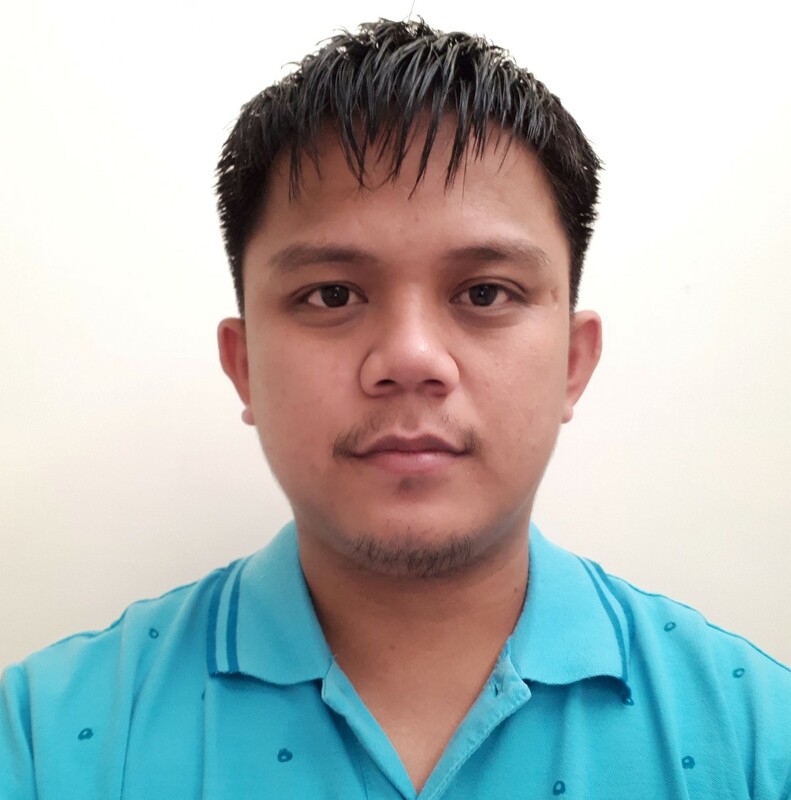 ", Unfortunately, data can't be saved if the approver will not re-submit the form. That's the only way to edit/update the form and to get an approval notification. I am not quite sure about this. If you want to pass data via URL parameter, that's possible as explained above but not on edit URL. Let us know if I have missed something or there's something that is not clear to you. Thank you! Will all this work if the form (spreadsheet) is stored in Google Docs? If the form is "Returned for Revisions" to the submitter, is it rendered as a form, or do we have to give them access to the spreadsheet to update field on it? The "Return for Revisions" or Edit_link feature will only work on the form. There is no means for the user to edit the integrated spreadsheet and re-submit it again to JotForm. Also, if you let a user EDIT the integrated spreadsheet , there is a high possibility to break the integration that can result in the submissions not being updated on the spreadsheet anymore. So, we highly suggest not to let the user be able to do this. You can just create a copy of the spreadsheet and let the copied version be the one editable. but if this is better off on a separate thread let me know. I have a form that the user submits to notify our highway department of street lights out. The Highway Dept gets an email notification and also has access to the integrated spreadsheet. The form has two additional fields at the bottom for the Highway Dept to complete, and then they need to forward the form to another email address. I can see how to set conditions so the form flows as needed, but what I can't figure out is how they get access to the form to fill in the fields at the bottom, since they just get an email notification when the form is submitted to them.